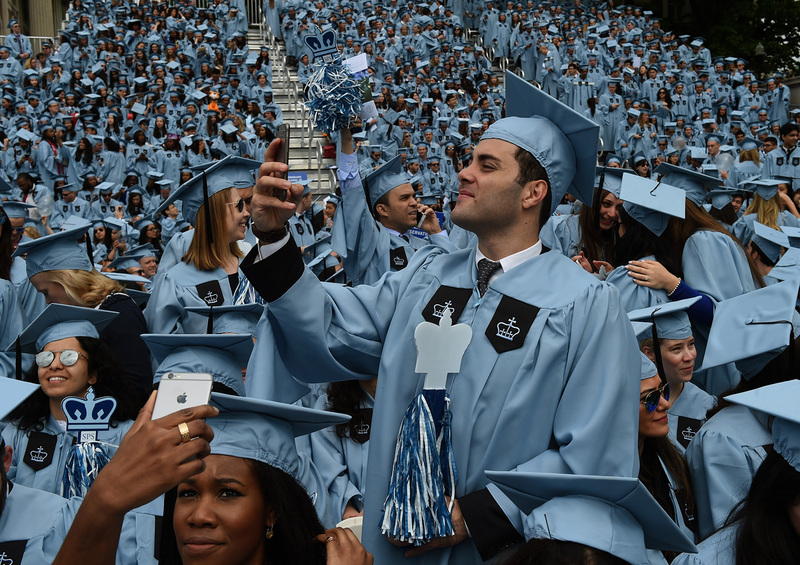 Graduating students arrive for the Columbia University 2016 Commencement ceremony in New York, May 18, 2016. I don’t think this should be an “either/or” question, because most people move back and forth between China and the U.S., or a third destination. Especially for Chinese graduates from American colleges, it’s almost impossible to limit our options to one place or another. The answer is flexible and personal, because what matters the most at one point may not be so important at another time, and life always changes. Many of my friends have moved back and forth after graduating from college. Some had worked in China for a few years before starting their MBAs in the U.S., and some had worked in the U.S. before going back to China. Just like me, some have been in graduate schools in the U.S., during which we had fieldwork years in China. Those who have finished their doctorates have either been continuing onto postdocs in the U.S., or going back to China to start entrepreneurship. None of us stays put in one place. 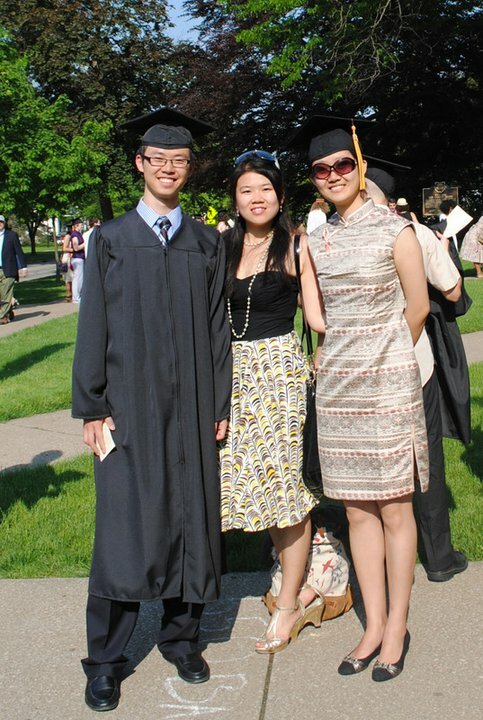 Chinese students graduating from Oberlin College in 2011, left to right, Penglu Zhao, Jiayu Lin, and Yidi Wu. I’m planning to get my Ph.D. next year, and I’m about to go on the job market. Every time when someone asks where I will go for work, my answer has been “anywhere but mainland China.” As a historian who wants to teach in college, my main concern is the academic freedom, which has been deteriorating in the past years in mainland China. It’s true that there are bubbles in satellite campuses of American universities in China, but there’s no guaranteed academic freedom in the long term. On the other hand, I don’t have to stay in American schools, even though I consider myself a product of American higher education. As the only child, it’s natural for our parents to expect us to return home after college in the U.S., especially if some parents can easily find jobs for their children. But our parents also want the best for our lives, and I’m grateful that my parents have been understanding and supportive when it comes to pursuing my dream and having my own way of life. Not all parents can travel to the U.S., and if they do, usually it’s for a short period. That means even if we as children decide to stay in the U.S., we will go back to China once in a while to see our family. For me, China means family and home, so I will always go back. The U.S. means school and work, and a home away from home for the past decade. I cannot simply choose one or the other, and I’m also willing to go beyond the two. I fully respect Wu Yidi’s wish to stay in the United States, knowing that she wishes to pursue an academic career in history, as well as her concerns over academic freedom in Mainland China. Wu Yidi’s comments also show that the question of whether to stay in the United States or go back to China after graduation depends on one’s personal values, goals, and career plans. In other words, students of different family backgrounds, disciplines, and values are likely to make different decisions. As a recent graduate with a degree in international relations, I have always wanted to work as an international civil servant and a diplomat in international organizations like the United Nations, where I can contribute to the well-being of all of humanity. However, the work of international organizations will never be limited to their headquarters in New York City or Geneva; a large part of the work must be done in the field. My world should be beyond the borders of the two greatest countries of our time. This past semester, my last semester as a graduate student in the U.S., it seems as if I’ve been asked “if I will stay or if I will go” more than a thousand times. As a matter of a fact, I’ve been asking myself this question since I started my journey to study in this country four years ago. Finally, I’ve decided to go back China. Why? First, as someone who relishes new challenges and adventures, I find China’s uncertainty and complexity attractive. China is changing so fast that, for better or worse, every industry and every aspect of society is being affected. I believe that the time has come for talented people to treat this uncertainty as an opportunity to better their societies and create new possibilities. Even though some of the news from China scares me and makes me worry about the future, I am also curious about what my future there might hold. This curiosity helped me decide not to stay in America. Secondly, as a married person I will have more opportunities to take care of my family and my relatives and friends in China if I work in China. The only demand my wife made after we married and I decided to come to America was that I should not put us in a situation where, in order to live with me, she had to live far away from her parents, who have chosen to spend their lives in Tibet. There is no reason why I should not respect her demand. I have no excuse or cause that is greater or more important. The last reason, and perhaps the most important, is simply that I did not come to America to become an American, although I understand and respect people who are motivated by this goal. For me, studying in America was a chance to gain an international perspective, which I believe prepared me to contribute to my homeland. I studied in America not in order to live here for the rest of my life and remain tied to this land, but in order to bring whatever I learned here with me wherever I go, so that in my work I may spread these values and this knowledge for the benefit of other people. I agree with Yidi in that this is not an either/or question. A lot of my Chinese friends in U.S. colleges picture themselves to work on jobs that allow them to stay connected to both countries. In fact, many Chinese students recognize this combination of Chinese background and U.S. education as an important competitive advantage over their domestic competitors on the Chinese job market. Like Yidi mentioned, I also believe people value different things at different stages of life, and for most of us, we are going to feel the need to reconnect with China at one point or another. A recent development to watch is that as the number of Chinese students in the U.S. increases every year, American education (especially at the undergraduate level) by itself carries much less prestige than it did five or 10 years ago. In response to this change, many Chinese undergraduates have an incentive to stay longer in the U.S. trying to get into graduate programs in better schools (i.e. the Ivy League), or to acquire professional experience that enhances their profiles. While many students look for opportunities to work in the U.S., things are not always in their control. Working visas for international students are granted through a lottery system. I have heard stories where among a group of 25 Chinese students applying for working visas, only two or three win the lottery and earn the legal status to work in the U.S. In other words, although many Chinese students would like to work in the U.S. during their early career, only a few succeed due to regulatory constrains. Other than the calculation for employment opportunities, cultural and social factors also matter a lot. Many of my friends find American values and lifestyles very attractive, but also value their Chinese origin and cultural heritage greatly. Sometimes, it is quite difficult to choose and/or balance between these two very different cultures. An extreme example is that some of my friends in the LGBT community have made up their minds to make every effort to stay in the U.S., as they are not willing to go back into an environment where they cannot be comfortable with who they are due to the lack of legal and social support. It breaks my heart to know that their identities have become the primary hindrance that keeps them away from home. I am lucky that I am not forced to make an either/or choice like my friends do, and I can afford to be greedy and try to stay close to both countries. However, I do have to figure out a way to balance between the cultures and traditions that I was born into at home, and the values and ideas that I picked up abroad. And that might be a task more difficult than deciding if I want to travel with a Chinese or an American passport. If people cannot vote by hand, they vote with their feet. This is why people flocked from East to West Berlin before the Berlin Wall was erected and why many Chinese parents send their children to the United States for an education. Of course, such a decision is not overtly political. The act of leaving home almost always entails personal loss and emotional pain, but the collective decision to leave—be it fleeing the borders, going abroad for school, or sending wealth abroad—suggests that the potential benefits abroad outweigh those at home. Most Chinese students in the United States come from middle class and wealthy backgrounds, and their parents are relatively successful in China. The underlying reason why Chinese parents still choose to send their children abroad is because they do not want their children to copy their success, for they do not want their children to bear the same physical, emotional, and moral costs of that success. Therefore, if given a choice, most individuals and families from China who prefer an American education to a Chinese one should at least seriously consider further personal developments in the United States in the long term. In the short run, however, I believe that keeping an open mind is a better decision than choosing to go back to China or remain in the U.S. before figuring out exactly what to do after graduation. For me, while the political environments and economic prospects of the places matter, the criteria for choosing what to do immediately after college are different than those for a way of life or a career. A liberal arts education equips me with few specific pieces of professional know-how but rather gives general skills that can potentially be valuable in many fields. Therefore, I consider it important to do work that puts my skills to effective use, hopefully benefiting others and shaping my own character. As a rising senior at Yale, there are many options ahead. But I do realize that having choices is a luxury. Of the 120 Chinese children in the educational mission to the United States in the 1870s, 22 went to Yale, but most of their college careers were cut short by the Qing government’s sudden recall of the mission. A few managed to escape and remain in the United States, but most returned to China. In China, instead of valuing their western education, the Qing court distrusted the Yale students. Although some of them contributed to China’s modernization, their potential was far from being fully realized. We have reason enough to believe that we live in a much better era, but in terms of choosing the environment we want to be in for our lives and our careers, maybe it will still come down to an “either or” question. Fortunately, I don’t have to answer this question immediately after graduation. For me, “should I stay or should I go?” is a really tough question. This is also a popular question that people ask me frequently, especially in this graduation season. I spent my entire college life in California. My college is an incredibly diverse place. I got to know so many people from distinctive backgrounds. I used to get involved in some student organizations, which see diversity as the most important thing to address and to promote. Having experienced this inclusiveness through my college, an open community in which to cultivate one’s personal traits and beliefs, I want to spend my future in an open and dynamic society where I can constantly find my limitations by looking at others. My college shaped me as a global citizen over the past four years. My goal is to live in an open community no matter whether it’s in China or the U.S. Last year, I spent one month in Beijing. That was an unforgettable month because firstly, I witnessed people’s anger after the Tianjin explosions. Secondly, I encountered a nationwide celebration of the 70th anniversary of the people’s anti-Japanese war and the world Anti-Fascist War victory. From my perspective, people’s reactions to these two things are very contradictory. I was thinking, “How come the same group of people, in a very short amount of time, condemned institutionalized failure and then immediately filled up with nationalist sentiment?” I was deeply frustrated because I saw many people just simply ignore the elephant in the room. This is the result of China’s extensive censorship program, which blocks people from accepting non-partisan reporting and seeing in-depth examination about authority’s misconduct. After these two cases, with sheer frustration, I visited Professor Benny Tai at his office at The University of Hong Kong. He asked me, “do you talk about politics with your Chinese peers?” I answered his questions with few seconds pause. “No, I never talk about politics with my Chinese peers no matter if I am in China or in the U.S.” His question intrigued me a lot. Some value-based gaps are already formed between me and many of my Chinese friends. These gaps raised up my anxiety of being labeled as “too Westernized.” Due to these unbridgeable arguments, I couldn’t even start to talk about politics or even slightly criticize the Chinese government’s wrongdoing. “Watch your behavior and stand on the right side, don’t get yourself into troubles!” This is a comment under one of my WeChat posts about presenting my senior thesis at a history conference. My thesis was about Taiwan history and Tsai Ing-wen. This comment came from my uncle, a high school principal who taught a politics course for more than 20 years. “Don’t become a traitor of your country,” he added. What I want to illustrate through my experience is no matter where I am, an open and judgement-free environment is the most important thing for me. People’s willingness to embrace diversity, openly criticize the authority’s misconduct, and respect different voices means everything to me. My answer to this question took a sharp turn over my two years at the Graduate School of Journalism at Berkeley, from “I will definitely return to China” to “I’d prefer to stay here.” My major concern is what is the best for me if I want to tell great stories. Journalism is all about telling lesser-known stories to the public. As a young journalist, I have always wanted to report on China. Before coming to the U.S., I interned at a state-owned media outlet in China and later worked as an associate news producer for foreign media. From my personal experience, I have seen stories about China being either misinterpreted or being killed by self-censorship. That’s the reason why I chose to go to graduate school and study journalism myself, because I believed I could do a better job. Even though I studied in the U.S., my focus has always been on China. I have reported on China’s foreign investment, China’s human rights situation, and labor rights violations. My thesis is about the gay community and HIV in China. After all, I grew up in China and know it well. I have been amazed by how foreign countries such as the U.S. are interested in what is happening in China. During my two years here, I was able to get to know many Chinese documentary filmmakers, photographers, videographers, and young journalists like me. They have their docs, photo essays, or articles published in American media. Many of these stories are very unlikely to be seen in Chinese media. Media censorship is just one obstacle standing in front of me if I want to go back. Protecting my sources is another. Take my thesis on the HIV epidemic in China as an example. Many of my sources refused to be on camera, or even just talk to me for fear of the story being published in Chinese media. (Foreign media would be fine with them.) Their main concern is their safety once their gay/ HIV identities are exposed. I used to think the best way to report on China was being in the country where all the stories happen. Now, I still believe stories are in China, but I’d rather stay out, maybe in the U.S. where I have a better chance to have stories published. In my view, the decision to stay or to go is ultimately personal. The patterns we find from some Chinese students often break down when we encounter many counterexamples. An only child can take care of aging parents regardless of where the child lives, and one can stay connected with the wider world without having to leave the bedroom. The dichotomy between risk and comfort also doesn’t hold. Some people find exciting opportunities in the changes and uncertainties in China, while others enjoy the challenge of succeeding in the United States. But in the meantime, some find it easier to live in a familiar environment back home, while others find middle-class life in the United States more predictable and reassuring. It is hard to say which country is more suitable for adventurers and which feels safer. My decision to return thus results from a mixture of personal reasons. As an only child, I want to cherish my time with my parents and take care of them when they are in need. As a risk-taker, I like the challenges and opportunities offered by China’s development. As a city person, I enjoy the fun and convenience of urban life in China. As an aspiring writer, I find it easier to connect with Chinese readers and to practice the art of the Chinese language. As a graduate student, the more I study history, the more I want to throw myself into the action and to understand the Chinese society up close. But these are my individual preferences, and I understand and respect those who choose otherwise due to their own beliefs and backgrounds. I also want to point out that the journey home isn’t as easy as we may imagine. Just as Yuanbo writes, since more and more Chinese students study abroad, the value of a foreign diploma may decline over time. Returnees without overseas working experience may not have much advantage when looking for jobs. But the longer one works overseas, the fewer incentives one may have to return to China. One may get so used to a foreign lifestyle that one cannot readjust to life in China anymore. Returnees may find themselves competing with competent peers in China who did not work abroad but have more experience navigating the Chinese society. These dilemmas also influence one’s decision-making process. We often liken our overseas adventures to those in the classic Chinese novel Journey to the West, but the return trip strikingly resembles the arduous journey painted in Homer’s Odyssey. Even after we reach home, we will see that our surroundings and acquaintances have changed while we were away. In the end, we are just arriving in a new place and need to go through the same process of reorientation. We returnees should not assume that we are going back just to instruct our Chinese-educated colleagues, because we too have much to learn from them. This mutual learning experience is why I think it would be worthwhile and enriching to embark on the difficult journey home. I agree with Yuanbo that we all are going to reconnect with China at one point or another. It was my trip abroad that made me realize how much I love about China. The twinge first came with the lack of authentic Chinese food abroad. Then the feeling of being unable to stay with my family and close friends, and the impact of cultural differences began to show. I have never given up the option to return to China at some point, but it’s becoming harder to decide when. Recently, the Chinese middle class has been experiencing growing pains. The outflow of capital and people signals an insecurity about the future. The slowdown of the economy, the pollution of the air, water, and food, the increasing suppression of civil society, and the undermining of the rule of law are major factors that cause fears and underpin the uncertainty of me going home. I can’t deny that China probably presents more opportunities for my personal career. As Ding mentioned above, stereotypes and prejudices against Chinese people exist. Moreover, there are many restrictions on foreigners who want to work in the States. One has to do what is related to his or her major to get a visa sponsorship to be able to work here, which greatly reduces his or her career options after graduation. Among the 233,000 H-1B visa petitions received in 2016, 65,000 will be granted visas under the general-category cap and 20,000 under the advanced degree cap (those with a Master’s degree or higher). And finally, if one is lucky enough to be selected in the lottery, she or he has to wait for another six months—from April 1 to October 1—for the work visa to take effect. With so much risk entailed to hire a foreigner, it’s not difficult to imagine why most employers don’t sponsor work visas. The more time I spend in the United States, the more I feel I am in a conundrum. I enjoy the political freedom, the cleaner environment, and the open-minded society here. The overseas experience makes me more humble and tolerant. But I also miss my family and friends in China, where I feel a true sense of belonging. Perhaps for the sake of my young child, I will stay in the States for now, where he can at least have a clean blue sky. Correction: This post has been updated to reflect the correct number of H-1B visas to be granted in 2016, according to data from the U.S. Citizenship and Immigration Services. I answered this question even before I came to the U.S., and the answer hasn’t changed: I’ll go back to China after I graduate. But the plan did change a little bit during my stay here in U.S.—at first I came here for a one-month summer program, but then I decided to stay longer for another one-year program at the International Center of Photography, because I found that the education in the U.S. is better, especially for the fields I’m working in—photography, journalism, and human rights. The reason I chose to go back after study also has a lot to do with my field and interest. I’m a visual journalist and I’m interested in reporting China’s stories. It’s always better to be there to tell the stories. I remember I had this similar discussion with Jieqian Zhang, and I totally understand why she chose to stay in the U.S. Her her field is more in data journalism and data is not very transparent in China. I also agree with her opinion on protecting sources, especially on some specific topics. It’s tricky if you are facing Chinese readers and you sometimes need to challenge their values. And our sources live among those people, it’s hard to protect them. My experience is similar with Jieqian’s—I’ve worked at a foreign media organization in China as well as at a Chinese media outlet. “I have seen stories about China being either misinterpreted or being killed by self-censorship,” Jieqian said. That’s happened to me as well. Since I began studying in the U.S., my teachers encouraged us to discuss the views of both insiders and outsiders. The Magnum Foundation Human Rights and Photography program—the program that brought me to U.S.—is aimed at training local journalists from different countries so that they can be better at reporting in their own countries as insiders. I learned a lot in the program and I really agree with its goal. Luckily, I found something that can kind of assuage my concerns. When I go back I’ll work for an English-language Chinese media outfit that targets foreign readers. Staff there are a combination of foreigners and Chinese. I hope I can provide a fresh view about China and I’m very happy to see that the content they have produced so far has touched on many interesting topics in China. There is never the perfect way. For example, I was also hesitant in my decision whether to freelance or work for a media outlet. I hope my choice is a relatively good decision for my current situation. I can’t say much about the distant future. Going back is just a plan for my near future. Maybe I’ll come back to the U.S. after several years to pursue higher education. Who knows?